Located in Ghenh Rang, just 10 km from Quy Nhon city center, Casa Marina Resort is a new bold charming place with long sandy beach and magnificent nature. The resort is designed with unique architecture and quiet space that will bring new experiences for a complete holiday of travelers wanting to find on the sea and soak in the sun and wind. The resort consists of 56 rooms and villas scattered over 1.5 hectares of land and hills. Includes Deluxe, Luxury, Villa on Hill and Sea Villa. All rooms and villas are designed with full facilities. Visitors to Casa Marina will be impressed by a cool lobby, overlooking the sea, next to the restaurant area has created a unique architecture complex and unique. Large swimming pool with Ozone filter and Jacuzzi. The resort is surrounded by the fishing village system suitable for the type of tourism and resort. Casa Marina Resort is an ideal destination for visitors to explore the wild nature and ancient cultural landscapes and wonderful seafood dishes of Binh Dinh, where is harmonious combination. The mountain-sea and is known as the "land of the sky" of Vietnam. 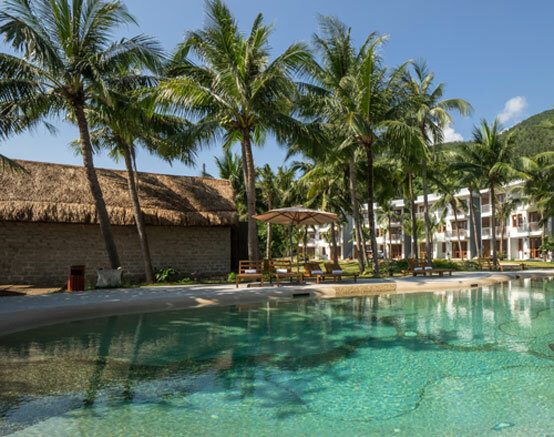 Casa Marina Quy Nhon has 56 rooms and villas, including 32 deluxe rooms, 08 oceanfront luxury villas, 08 sea-facing villas and 08 ocean-facing villas that can directly go to the sea. All rooms and villas are designed with full facilities. In-room amenities include air conditioning, 43 inches TV, free WIFI connection, private balcony, telephone, mini bar, tea and coffee making facilities, hot water, hairdryer, bathrobe and slippers and bathroom stand.